Task Tamer. I came up with that name for my business because I felt it captured what I can do for my clients. I find the responses interesting when I mention what I do because everyone interprets tasks differently. For some it is running errands. For others it involves small projects they never get around to finishing (or starting). For a lot of people it is cleaning out closets or cupboards. A few clients have wanted me to type up papers, research vacation activities and do small sewing projects. I like to say I will help you cross things off your to-do list so you have time for higher priority activities. The last few weeks I have been helping with a relative’s house clean-out. Downsizing is a huge step for many people and when it means divesting themselves of a lifetime of accumulation, it can be a monumental and overwhelming task. Tempers can flare, tears can fall and, most importantly, laughter comes as memories get uncovered. When a house is full of all kinds of memorabilia many decisions have to be made about what to do with everything. It is easy to get into a groove of flipping through stuff and making quick decisions about what to save and what to toss. But I think it is very important to slow down occasionally and take a few minutes to reminisce. I try to remember that everything I touch represents a moment in time in someone’s life. A moment that may have been happy, sad, thoughtful or routine. As a dumpster fills up it can be very bittersweet because each item represents a lifetime and yet it is liberating to be free of a lifetime of accumulation. I encourage everyone reading to think about what you have been hanging onto and take some time to decide if it is something you need in your life forever. Sometimes the answer will be yes. Often you will find new homes for things and feel good about knowing someone else will be enjoying what you have enjoyed having. Trying to do this when you have a small window of time can be stressful and overwhelming. The more you can get through before the time comes to move or downsize the easier it will be to relocate the things that are most important to you. 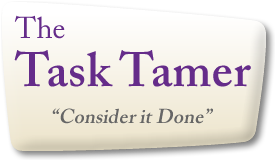 Of course if you need help, give the Task Tamer a call! The last few weeks have been so busy with this task I have not been doing much cooking. We are almost at the end, though, and I should be back next week with a recipe!